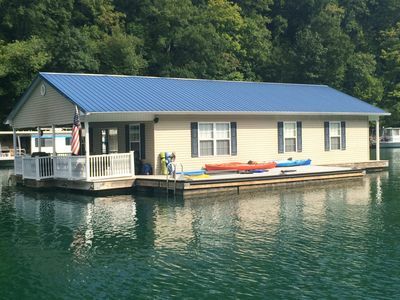 Faith, Family & Friends are best enjoyed when they are all on the banks of beautiful Norris Lake. 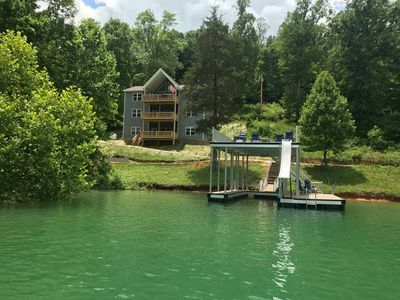 Being at the Faith, Family & Friends home, you will enjoy a spacious floor plan in a beautiful lakefront setting and a private dock with a slide. 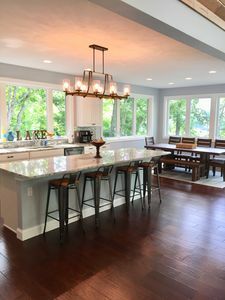 With 9 bedrooms, 5 full baths, and 2 half baths, our Faith, Family & Friends home is designed especially to help you enjoy your Faith, your Family and your Friends. 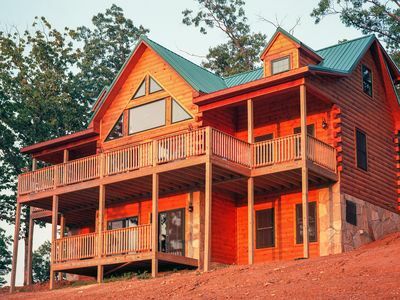 It sleep 24 comfortably, making this home perfect for extended family vacations, multiple family gatherings, or special events. 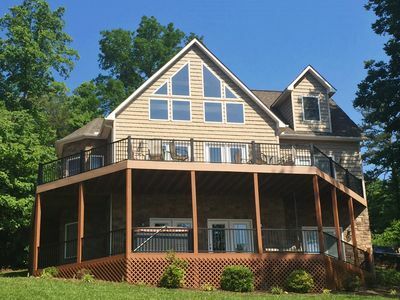 Highlighted by vaulted ceilings on the main level, 2 kitchens, 3 family rooms, and 3 decks, this home offers such a wonderful vacation spot that you will want to bring your Faith, Family and Friends back again and again. We no longer allow pets at this property. 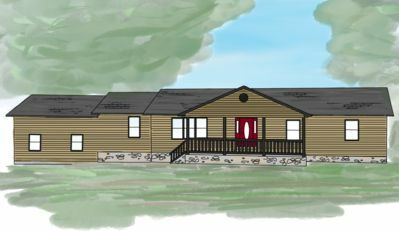 The main level of Faith, Family & Friends offers a spacious kitchen, a pantry, a large dining room table, a half-bath, and a family room featuring a fireplace and a 50" flat screen TV with a DVD player. 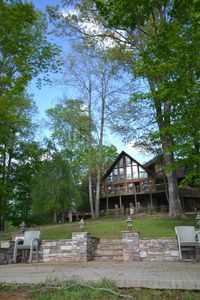 There is a large deck on this level with 2 grills, and the entire space offers spectacular views of the lake. The master bedroom features a king bed, a full master private ensuite, and a TV. 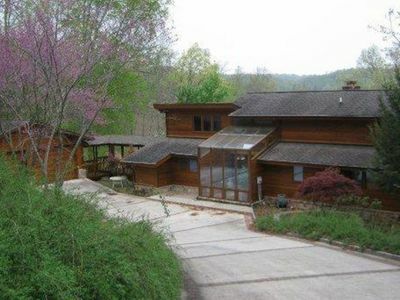 And there is also a covered front porch with rocking chairs. The upper level features 2 bedrooms each with a queen bed. There is a jack-n-jill full bathroom between the bedrooms, but each bedroom also has a private sink and mirror. 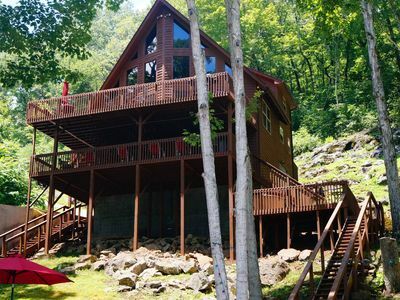 The Upper level contains 2 sets of twin bunk beds and a half bath. 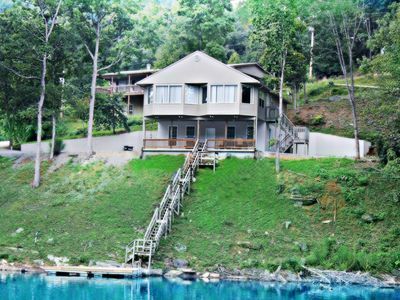 It is perfect for tweens and teenagers and their friends. 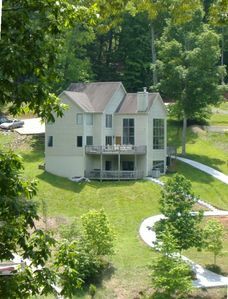 Faith, Family & Friends lower level is an amazing retreat all by itself. 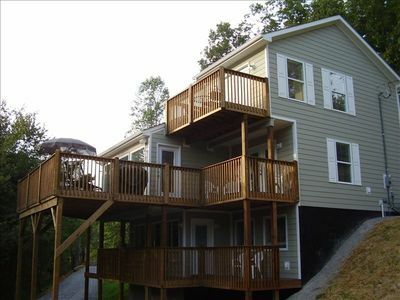 It has a kitchenette with a full sized refrigerator and stove. 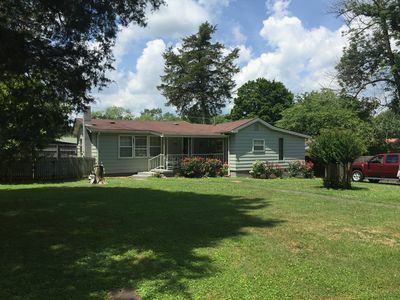 The second family room has a very large, comfy sectional, another 50" flat screen and DVD player, and a pool table with a ping pong topper, as well as a dartboard. This level also has 2 bedrooms and 1 full bathroom. Each bedroom has a king bed and each with a TV. 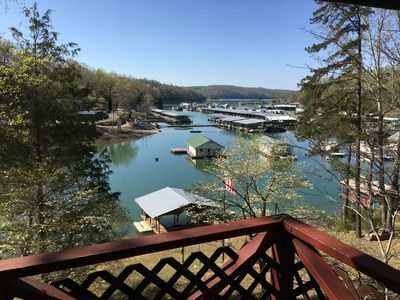 Another amazing deck is attached to this level offering multiple tables and chairs as well as 2 swings to enjoy the lake with a cup of coffee, a good book, or your favorite grilled meal. 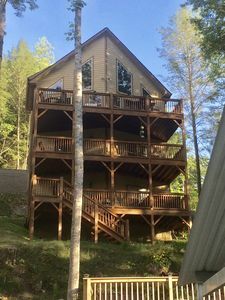 The walkout level features 3 bedrooms, one with a queen bed and lake view, one with 4 twin beds, and one with a double bed plus 1 set of twin beds. 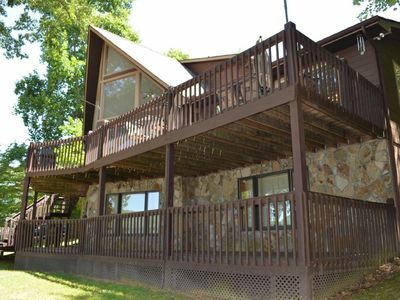 It also features a family room with a lake view and with a 32" flat screen TV. 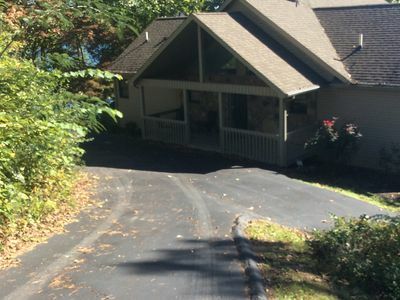 The laundry room with a washer and dryer is also on this level, and the covered deck on this walkout level provides access to the lake and the hot tub as well as more tables and chairs. 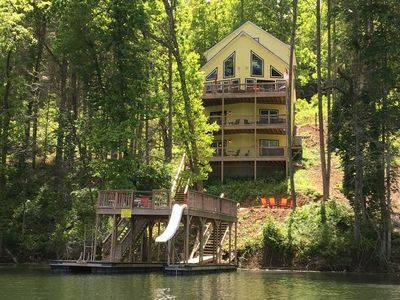 The outside of the home features direct lake access as well as a private, double-decker dock with a slide. There is a firepit with chairs and a set of Corn Hole tables. The dock provides room for 3 boats with one of the boatslips being covered. 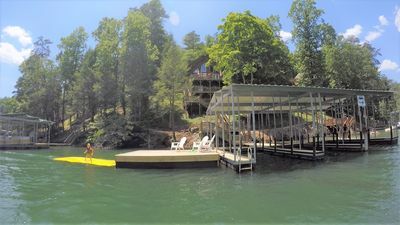 The upper deck features 3 sets of tables and chairs so that lots of family and friends can enjoy the lake and the sun. 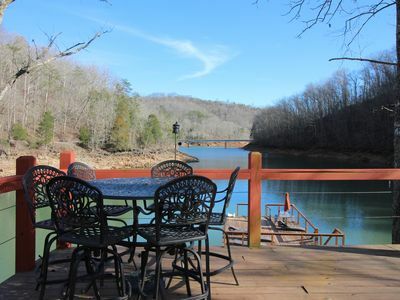 Breathtaking View near Springs Dock with boat slip included! New 2018. Secluded, lakefront property not in suburbia.